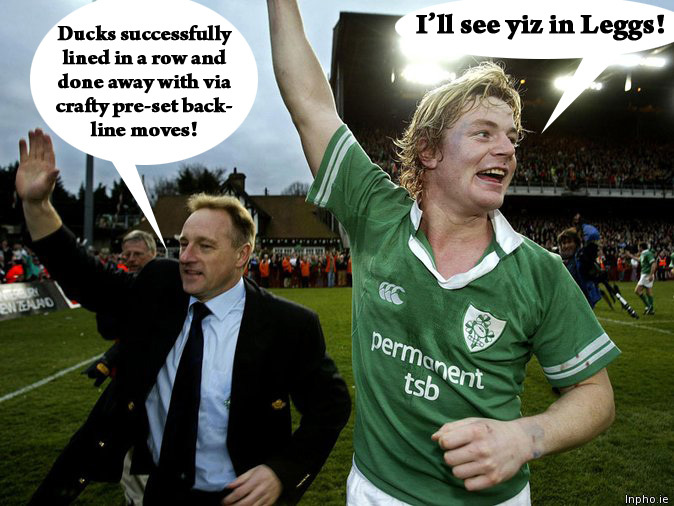 A decade worth of Six Nations tournaments under two coaches for Ireland, and what have you got? Some kack-handed analysis of the most basis of statistics, that’s what. Hooray! What we can see pretty clearly from the list above is that there are actually not too many statistical surprises waiting there for us; maybe you could say the sheer volume of points we leaked in 2002 – 37 more than in the next worst outing of the decade, and almost twice as many as in 2009. Looking back over those results it was a very uneven, high scoring championship: we got plowed by Les Rosbifs in Twickenham 45-11 and by the French in Gay Paris 44-5 in the last game of the tournament. We did manage to absolutely lay the wood on Wales [54-10] and Scotland [43-22] in Lansdowne, and also beat Italy comfortably enough [32-17]. Secondly, I had always thought that 2006 was a step above 2004 – probably because it came down to that magnificent win at the very end of the championship when Shane Horgan stretched over to dot down one of Ireland’s best tries of the professional era. Actually, we scored 5 more tries in 2004 and conceded 15 less points [a handy try/match extra and 3pts/match fewer] and were only beaten by an extremely good French team [check out the teamsheet: http://www.irishrugby.ie/rugby/match_centre.php?section=lineups&fixid=1142 – quality from 1-15] in Paris. Other than that, it’s clear that the two championships which the vast majority of Irish fans would point to as our most successful were, statistically, our most successful. We scored tries and points like they were going out of fashion in 2007 under O’Sullivan, and we defended brilliantly in 2009 under Kidney. i] Kidney’s teams don’t score as many tries as O’Sullivan’s teams did. From the last ten years of the tournament, four of the top five Irish try-scoring teams were O’Sullivan’s. Two O’Sullivan teams [2004 & 2007] bagged 17 tries in 5 games, which averages as 3.4 tries/match. Another one bagged 16 , which is scoring at a rate of 3.2 t/m, and another two [2005 & 2006] bagged 12, which is a rate of 2.4 t/m. This is the rate that Kidney’s Grand Slam side of 2009 was scoring tries, which, of his three Six Nations tournaments to date, is the highest try-scoring rate that a DK team has managed. ii] O’Sullivan’s teams were a more free-scoring bunch overall. O’Sullivan’s teams averaged over 127 points per championship, or 25.4pts/game. Kidney’s teams have averaged just 107 points per championship, or 21.4pts/game. That’s a 20pts/championship and 4pts/game advantage in EO’S teams’ favour. They were also able to put teams away more effectively. Of the points differences [PD] – the gaps between what you’ve scored in the championship and what the opposition have scored against you – four out of the top five highest margins were O’Sullivan teams. The first ranked of these was 2007, when our PD was a whopping 65pts – averaging things out, we theoretically beat every team we played by 13 points. The next was a very respectable 2009 PD of 48pts – Kidney’s Grand Slammers outpointed every opponent statistically by 9.6pts. 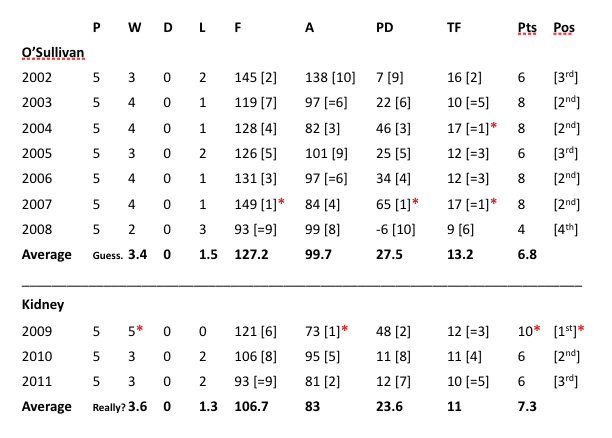 In the top five defensive performances [based solely on points concession, not preventing tries], all three of Declan Kidney’s teams feature, as opposed to just two from seven O’Sullivan teams. Kidney’s team average a concession of 83pts/championship for 16.6pts/game, as opposed to O’Sullivan’s 99.7pts/championship for 19.9pts/game – that’s a 16.7pts/championship swing [and a 3.3pts/game swing] in Kidney’s favour. It doesn’t quite make up the difference that E’OS’s teams established in point-scoring, however: they scored 4pts/game more than DK teams. The 2009 champions were peerless defensively, conceding just 73 points during the tournament, an average of 14.6pts/game. This year’s vintage  were second in line, conceding 81 points over the championship, or 16.4pts/game. An O’Sullivan team’s best defensive effort came in 2004, when they conceded 82 points in the championship, 16.4pts/game; they also managed to score 17 tries in the championship, which ties 2007 for the most tries/championship we have scored in the last decade. Good year! Obviously 2009 was our most successful season, because we won the championship and won all our games. That should go without saying, but it was hugely, hugely important to actually win the thing, and to do it with a Grand Slam was magnificent. Looking at the evidence that even a casual overview of these records throws up, a few things jump out. We scored more under O’Sullivan, and especially more tries, and Kidney’s teams defend better. Kidney has managed the media extremely well, in contrast to O’Sullivan. Since the end of 2009, Irish rugby has been on a downturn – some say that when you’re at the top of the hill, the only way to go is down, but we were never at the top of the hill. We got quite close to the summit, beating an outstanding [if knackered] South African team in November, but a week before that we failed to beat a Wallaby team that finished last in the Tri-Nations two months earlier, only winning one game out of six. In our first big test as Six Nations champions we got absolutely hosed in Paris in February 2010, losing 33-10, and then disastrously lost to Scotland in the last match of the championship at home. Very, very sloppy stuff. Under O’Sullivan, Ireland’s previous downturn began in August 2007, and he was out of a job shortly after St Patrick’s Day 2008, a mere seven months later. It was a collapse of startling proportions which, frankly, came out of nowhere – looking back on how well we performed in the 2007 Six Nations, we had every right to be confident going into the world cup. However, Kidney’s teams are scoring less points and less tries every season [though this isn’t solely down to him or his coaching staff] and generally giving spectators very little to cheer about. They’re also slipping down the Six Nations table at a steady rate, and when you’re not scoring tries, you’re not playing attacking rugby, you’re not winning matches and you’re not taking home trophies, what is there to cheer about? This entry was posted in Opinion and tagged Drico, Faulty Conclusions Drawn From Misunderstanding Basic Statistics, Ireland, Razor-sharp incisiveness and inventive lines of running, Six Nations, The Dagger by dementedmole. Bookmark the permalink.